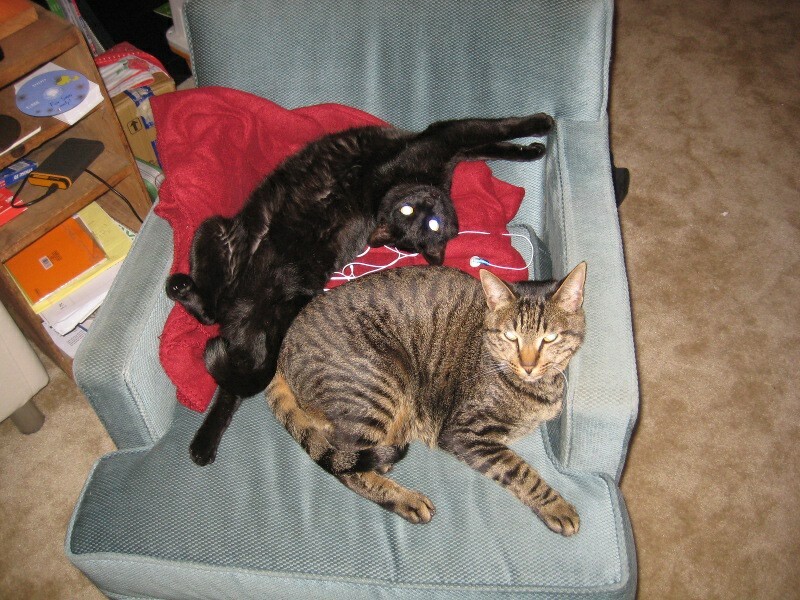 Two well-travelled cats need a new home in/around Bay Area/Northern California..
Hey everybody. A rat-collecting friend of mine recommended I post on this forum concerning my two cats that I'm looking to re-home. I'm going to be moving back to the Midwest quite soon following a horrible break-up after a long relationship. I've made the difficult decision that I should probably part with my two cats. They're very dear to me, but I don't know where life will take me and I'm not sure I can give them the love and attention they deserve. I'm looking for someone to adopt them as soon as possible, because it would break my heart if I had to put them in a shelter. Anyways, I'm looking for some responsible folks who may want to provide a home for my cats for the rest of the little felines' days. I thought that someone in the network might know of some caring people who want a couple little buddies. Their names are Bean and Bronco. Bean's a female black cat and Bronco is a male tabby (or so I've been told). Bean looks like the black cat in the movie "Kiki's Delivery Service", and Bronco's just plain cute. My ex-girlfriend and I rescued them off the streets in Taiwan, nursed them to health, and raised them from kittenhood. We raised them speaking English . They're very friendly cats with vibrant personalities, but I think young children would stress them out. I'd estimate their ages to be 2 to 2.5 years. Bronco's more of the independent macho male who likes to show off and Bean is stubborn and always looking for someone to cuddle with. They're well-behaved and they understand boundaries well. All it takes to keep them out of the kitchen is a squirt bottle, a hiss, or a raised voice. Both cats are fixed and I'll be sure to have them up to date with medical if I find the right people to take them in. I'm not sure how traumatized they'll be with this change, but I think that after a couple weeks they could warm up to new people pretty well. Like I mentioned before, I probably should part with them. I don't want to, but my future is really uncertain and I think it would be best if I found them a home when they're still mentally-flexible to make the change best. I love these two little cats so much and I'm sure the right home could fall in love with them too. Thanks in advance for any help you may be able to provide in this matter. Re: Two well-travelled cats need a new home in/around Bay Area/Northern California..
Can anybody give me a tip on how to post some pics (JPG)? Otherwise, if you're interested, I'll have to send them to you through personal messages or something. Thanks. In order to post images you need to upload them to a photosharing site like photobucket or flickr. Then, you copy the url address, and post it surrounded by img tags. You can't send personal messages until you've posted 10 times, but you can receive them, so if people PM you their email addresses, you can get in touch with them more easily that way. Here's some photos. 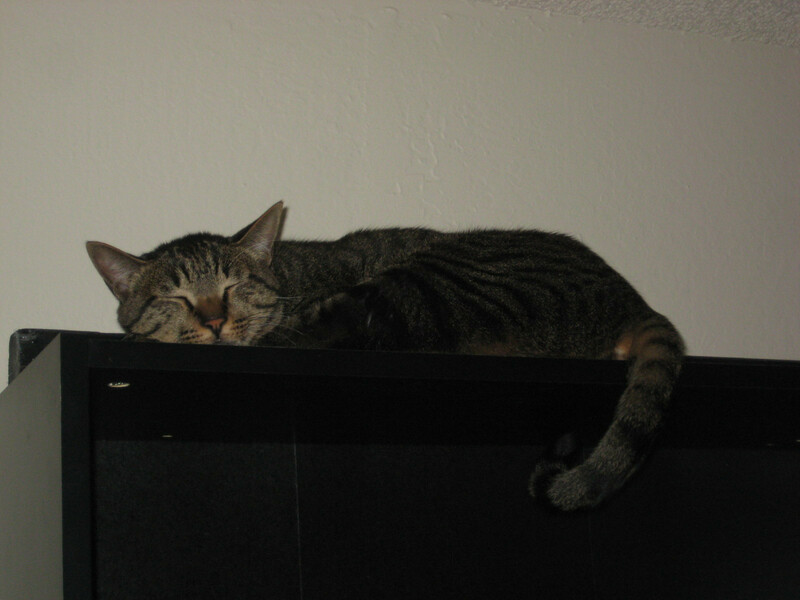 The first is Bronco taking a nap upon the highest place he could get to (a hobby of his). The other is of the Bronco and Bean curled up next to each other.